Every day, millions of Americans put their physical wellbeing in the hands of the US healthcare system. With this in mind, it can be alarming that 1 out of every 20 hospitalized patients will acquire a healthcare-associated infections (HAI). According to a recent article published by Internal Medicine News, the Center for Disease Control’s (CDC) recorded 440,000 adult patients affected by HAIs in 2009, which cost the healthcare industry $9.8 billion. Among those documented were SSI, CLABSI, CAUTI, VAP and CDF, the top five most frequently occurring and costly HAIs. Interestingly enough, these were also the most preventable and well-monitored. As noted in the article, the “Five top hospital-acquired infections cost billions,” anywhere from half to three-quarters of all nosocomial infections documented in 2009 could have been avoided through the use of technology and infection control best practices. Two applications which healthcare leaders should explore more closely are location-based infection prevention technologies are hand-hygiene compliance monitoring and asset tracking/management. Both of these applications can help improve patient safety by alleviating the incidence of three of the top five HAIs: CLABSI, CAUTI and VAP. According to the CDC’s Checklist for Prevention of Central Line Associated Blood Stream Infections, adhering to (World Health Organization (WHO) hand-hygiene best practices, sterilization of medical devices and the appropriate placement of clean versus soiled dressings are conventions integral to lowering cases of CLABSI. Increasing compliance in these areas can mean lowering device- and hygiene- related risk factors, helping to decrease HAIs. The same applies when dealing with CAUTI prevention. As outlined by the Healthcare Infection Control Practices Advisory Committee in the Guideline for Prevention of Catheter-Associated Urinary Tract Infections 2009, “optimal cleaning and storage procedures (e.g., wet vs. dry storage) for catheters used for clean intermittent catheterization” as one of the important means to prevent CAUTI. This can be as simple as setting up a system which has the capacity to monitor within any given unit of a facility. Similarly, the third most common cause of VAP is the use of contaminated equipment. Among prevention methods are active surveillance of VAP and adherence to hand-hygiene guidelines, as stated in the Society for Healthcare Epidemiology of America’s Strategies to Prevent Ventilator-Associated Pneumonia in Acute Care Hospitals. Implementing a system which automatically monitors and captures hand-hygiene compliance and noncompliance events 24/7 makes it easy for facilities to take corrective action and improve hand-hygiene compliance. To this end, mobile medical equipment location accuracy can play an invaluable role within the healthcare field. Knowing with 100% certainty the locations of clean (versus soiled) medical equipment and devices is critical to help prevent unnecessary infection risk. Ultimately, the contraction of HAIs depends on several risk factors, such as patient pre-disposition as well as clinical staff education and awareness. 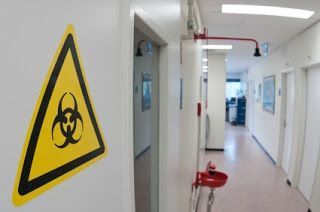 However, to begin the process of eliminating HAIs, hospitals and other healthcare facilities can implement location-enabled applications that manage hand-hygiene compliance rates and locate contaminated assets. Real-Time Location Systems (RTLS) can be implemented to promote patient satisfaction and safety while helping to ease the financial strain placed on hospitals and clinics.